Savannah summers: The traffic races on Victory Drive as the locals head east for a coastal cooldown. But this year, something’s different along the route. They can’t help noticing a kaleidoscope of fresh fruits and vegetables and the steam of boiling peanuts kicking into the air before crossing the Wilmington River, animating Charlie Teeple Sea Products. It’s a Sunday afternoon and Charlie’s in his office, taking a last minute telephone order for a Lowcountry boil. 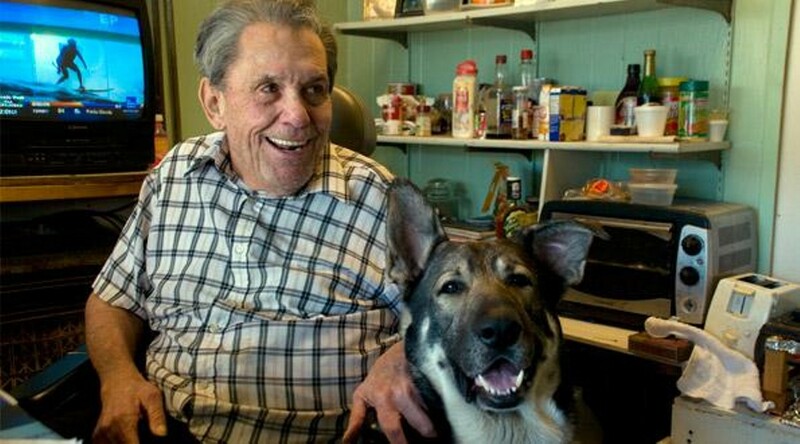 Jerry Polk patiently sits across from him in the heavily worn visitor’s chair; shamelessly wearing his eggplant purple Crocs as he pats the head of Charlie’s superhero sized German shepherd, Thor. The door swings open as Gail, Charlie’s right–hand woman, marches in and drops a plate of steaming corn on his desk, right next to a crate of plump red tomatoes and a loaf of Diane Polk’s banana bread. She intercepts the telephone order and bustles back out to command the kitchen. Charlie keeps it fresh out of the sea, and Jerry keeps it fresh off the vine. Both generations deep in their industries, they’ve been building relationships with small, independent fishermen and farmers for 60–70 years. So when Charlie caught wind of Polk’s Produce shutting down on Liberty Street earlier this summer, it only made perfect sense to dial up his old friend and offer him the space to set up shop right alongside Charlie Teeple Sea Products on Victory Drive in Thunderbolt. 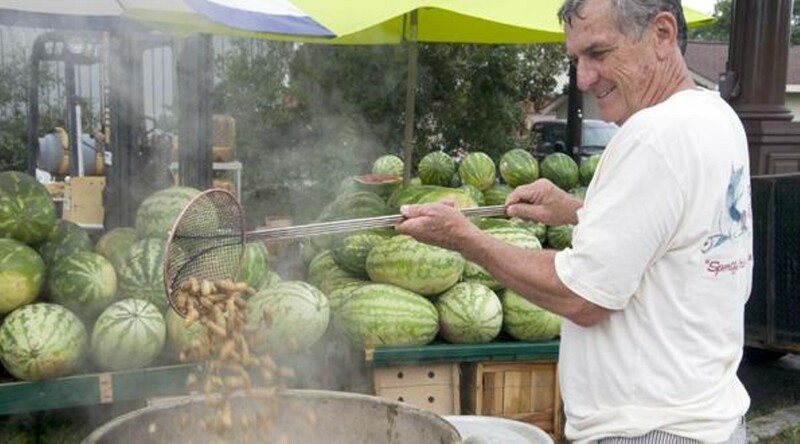 “I always thought produce would sell well right here on Victory Drive,” Charlie tells me, and so much that he gave it a whirl 10 years ago, boiling ripe, green Georgia peanuts and selling them by the bushel in his seafood market. And even though it was short lived, he never lost sight that his location was a prime spot for “someone who knew the business." “The seafood and the produce go wonderful together,” Jerry says as he weighs a carton of fresh blueberries and a bag of butterbeans for a customer. Under his feet, a black and white kitten, “Sweetie Polk,” nibbles away at a cob of silver queen corn in a cardboard box. “You go over there and get shrimp from him and come over here and get tomatoes from me,” he adds. She wasn’t a tourist, and Charlie’s been around since the early 1940’s; a 10–year boy rushing to the creek after school and dropping crab lines off of an old, wooden bateau while his aunts and uncles anxiously awaited to purchase their Friday night seafood. We live in a coastal city where the average consumer, tourist or local, doesn’t realize the difference between Wild Georgia Shrimp and pond-raised imports from Argentina and Thailand, or that the average grocery store and restaurant opts for cheaper imports over supporting local shrimpers. Have you noticed the abandoned and sinking shrimp trawlers in our waters? Charlie remembers when up to 50 shrimp boats fought for dock space along Thunderbolt’s bluff, before the disputed construction of the waterfront condos currently blocking the view of the Wilmington River. That wasn’t too long ago – in the 1970’s, when he ran his 40–year seafood restaurant, Teeple’s, on the bluff, known by many fishermen as a haven after returning from sea. But the challenges facing the seafood industry are no match for Charlie’s grit, and he continues to reel in wild Georgia shrimp, blue crab, flounder and whiting daily, fresh off local fishermen’s boats, until cooler weather brings new flavors from the sea. And with his recent installment of a sit–down bar, you can now take off your shoes off and stay for a while over Gail’s gumbo or deviled crabs, or the coldest beer in town with a Lowcountry boil. 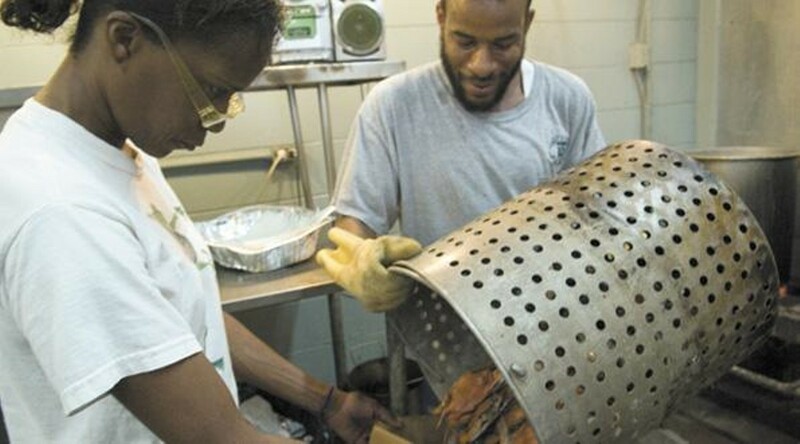 Not only the remaining men and women who continue to harvest seafood, but now even the staple of Savannah’s fresh produce industry, Jerry Polk, who in turn can continue to support his local harvesters. They’ve both been around awhile, and you better believe they know where the find the good stuff.